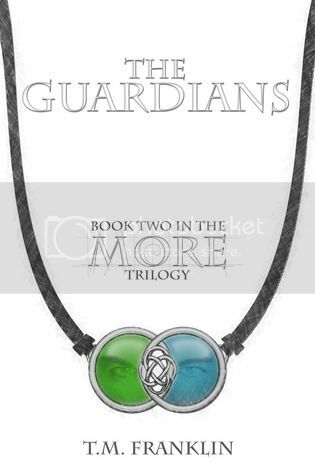 After a wonderful debut by this author with the first installment of this series More (my review), The Guardians was an amazing and action-packed sequel that did not disappoint! There were so many elements I adored about this novel. Right off the bat, we get some sweet and swoony moments between our two main characters, Ava and Caleb, showing us just how much their relationship had progressed since More. I must say, this approach totally won me over. I was instantly right back with these two and anxious for, well, more! It was such a sweet slow build in the first book with a romance that had just begun to bloom and here we get the payoff! It was so worth it! We also learn a lot more about this life and secret world they live in, including their powers and those of others around them. Ava and Caleb find themselves in danger once again and with a twist on the whole damsel in distress storyline, it is Ava who is off to rescue her man, with the help of an unlikely ally. Ava just becomes more and more likeable as the series progresses. She has such a fire and she wants to tap into all of her potential and powers. There are a few scenes where I felt like I was in an X-Men movie. So much excitement with all of these extreme powers swirling around that were just crazy good. If you are a fan of that, this is definitely a series to check out. Not to mention new characters who entered the fold that left me wondering just who to trust. The world building continued to grow, like the characters. As with what the title suggests, the Guardians play a huge role this time as well as learning about Ava's mysterious past, pulling all the pieces together of this whole Race and the war brewing among them. The pacing was perfect and I am left desperately needing the final installment! This is one sequel that drew me in and wouldn't let go! I strongly recommend this series if you like swoony boys, strong girls and of course some paranormal aspects that pack a punch! I was able to ask the lovely author some questions about the writing of this sequel, check it out! 1. How did the writing process differ working on this sequel as opposed to writing MORE? I learned a lot while writing MORE, and even more after it was released. I did listen to the criticism I got from some readers about the first book – some thought the beginning was a bit slow – and tried to apply that to the second book. It was a bit easier because we already knew the characters, so I was able to sprinkle the additional back story throughout the book and try to keep the pace up a bit more consistently. I hope I succeeded in that regard. The biggest challenge to me was to make sure that The Guardians didn’t suffer from the so-called middle book syndrome. I didn’t want it to be a filler between the first and last books. Although I had a general story arc encompassing the whole trilogy, it was important to me that each book be a complete story as well, with a satisfying end, even though some questions would remain unanswered until the last book. So that was in my mind the whole time I was writing The Guardians. 2. The cover of MORE was designed by yourself, what was your inspiration for this sequel's cover? Ava blinked back tears, rubbing her thumb over the green stone. “It’s beautiful,” she said. “But I can’t accept this. It’s too important to you.” She held it out, but he wrapped her fingers around the pendant, holding her hand tightly. “She wants you to have it, too,” he said, swallowing thickly. “I think it’s her way of letting you know that even though she has to fulfill her duties to the Council officially, she’s glad you’re in my life, personally.” He leaned in to kiss Ava, their clasped hands pressed against his chest. Ava melted against him, the feel of his power familiar yet not diminished in its intensity. When he reluctantly pulled away many minutes later, they were both breathing heavily. The Guardians play a big role in this book (obviously, given the title) and the relationship between Caleb’s parents is revealed a bit more, as well. Their relationship has influenced Caleb a lot, especially in how he views his own relationship with Ava, so the necklace is important in that regard. The mismatched eyes are a continuing theme—a representation of the Race—that I wanted to carry over to all three books. You’ll see them again in the cover for the third book, along with another symbol that’s significant to the end of the trilogy. 3. From the synopsis of The Guardians we learn that Ava is accused of a crime she didn't commit. Have you ever been accused of something you were innocent of? No, thankfully. I have been stolen from, however. We’ve had our house broken into, and I’ve had work of mine plagiarized in the past. That feeling of betrayal and violation is horrible, and I can only imagine it’s multiplied when you’re accused of something you didn’t do. 5. Favorite book you've read this year? Ooohhh… good question. I read Divergent and Insurgent earlier in the year and LOVED both of those. I’m waiting on Allegiant right now, although by the time this posts, I hopefully will have already read it. I also just read an amazing short story last weekend by a friend, Amber L. Johnson. It’s called Where We Fell, and it was SO good! 6. Can you tell us what you are working on now? I’m working on writing the third book in the trilogy, which will be out next fall, and I’m editing another novel that will be released hopefully in the late spring or early summer of 2014. It’s a young adult romance—no super powers or anything—about a teenage boy who’s a little different and quirky, and he’s okay with that. He sets out to win the heart of the girl of his dreams and learns a little bit about what a girl really wants in the process. 7. Describe this sequel, twitter-style, in 140 characters on less. The Council’s after her. The Rogues want her. The cops think she’s a killer. Now, to survive, Ava must join forces with The Guardians. I’m sure the next book will be just as great. Thanks for the giveaway and continue to do what you do best!!! Great review and interview! I haven’t heard of this series yet but will have to check it out now. They sound really good and I love the X-Men! havent read the books so i really don’t know.. Sounds like a good addition to the family.